Who does not want to feel fresh all throughout the day? To make us feel fresh and pleasant all day long, we go for deodorants or body sprays as per our likes and choices. Some likes those strong fragrances while others go for those mild ones. I am also a user of such refreshing body spray and mostly go with the Yardley products. Yardley is an old company and is known best for its products. It has made a large difference in its packing style and enhanced it a lot. 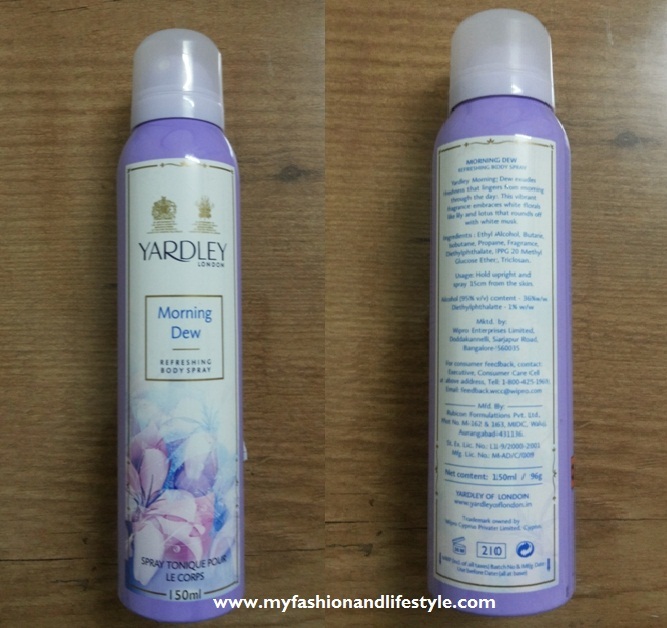 Today I am going to review Yardley Morning Dew Refreshing Body Spray. The packaging of the product is of light purple with flowery shades in it which can attract any woman easily. It is easy to carry with us while travelling too as it’s not too bulky in packaging and covers less space. I am using Yardley morning dew refreshing body spray from last 6 months. It promises to provide freshness from morning through the day with fresh and flowery essence of Lily, lotus and white mask which can make you really feel happier inside everyday with a new feeling. Using this spray made me feel like enjoying the luxuries. The smell is really mesmerising when sprayed. It can make turn anyone to you just by the fragrances. It’s more of musky than that floral ones. The fragrance is really feminine and would mostly suite to those in 20’s. It contains a high amount of alcohol which I don’t consider as a good sign. Though it does not give any kind of bad odour if directly applies on your skin. Though it promises round the clock freshness and protection, it had failed in the same. But it’s quite affordable and the fragrance is quiet lingering. A perfect refreshing body spray for the urban women who are conscious of their body fragrance. It does not leave any kind of odour even after it gets dried. Though it is not providing what it has promised, it fulfils the same with its elegant fragrance and odour free dryness. I would give 4 out of 5 for this product. You may buy it if you want to try usual floral than other fragrance. Don’t forget to share your experience with Us! !